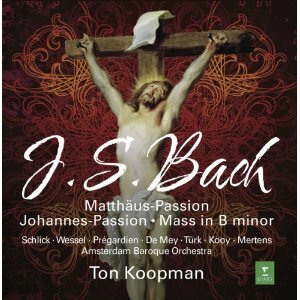 You either love or hate Ton Koopman's Bach, which is ironic as he is pretty middle of the road. His detractors will point out that he has a very rigid approach to tempo, especially in the string accompaniments to wind and vocal solos. But there is plenty to like about his performances, the grandeur of the choruses, the interpretive coherence, even the sheer quality of the musicians he works with. But what he offers you have to except on his terms. If you like a single aria in one of these recordings but don't like the choruses that surround it, that's unlikely to be enough for you. Despite his undeniable pedantry with tempos, many aspects of Koopman's readings of these three great works hark back to the pre-period-performance days, to Richter, Karajan et al. Many of the choruses (the opening movements of the Matthew and the B Minor Mass are great examples) are taken at a stately pace, perhaps not quite as slow as Richter, but certainly in his spirit. To Koopman's credit, he is able to maintain the immediacy and the excitement of this music at these relatively slow speeds. He also keeps the choral counterpoint (his use of large choirs will also be considered as a throwback in some circles) nice and clear, despite the fact that the recorded sound tends to emphasise atmosphere over detail, at least where the choirs are concerned. Personally, I'm in favour of these slower speeds. What I don't like is the sudden gear changes in the lead up to cadences. Considering the strait-jacket tempos these movements have been held under until their final bars, these closing gestures seem extreme to say the least. Recitatives and arias are also kept at fairly strict speeds, but don't seem quite as constrained because all the vocal and instrumental soloists know how to make their music sing. Special mentions should go to Guy de Mey, an Evangelist as good as any, Peter Kooy, recorded here when he was still at the height of his powers, violin soloist Andrew Manze (it is nice to see his name cropping up in this surprising context), and oboist Marcel Ponseele, who could do with a little more space from Koopman, but who otherwise demonstrates just why he is held in such high regard. The choirs, The Netherlands Bach Society in the Passions and the Amsterdam Baroque in the mass, are both on fabulous form. As I mentioned, the sound engineering isn't geared to giving the choirs clarity or presence, but the singers more than make up for this with punchy consonants, clear vowels, and most importantly, exact ensemble. It is interesting to see that the choir master listed for The Netherlands Bach Society is Jos van Veldhoven. These recording were made in the early 1990s, but van Veldhoven is now the choir's principle conductor, and is releasing various Bach works on the Channel Classics label. No doubt he has learnt much from Koopman over the years, but to my ear he has also surpassed him in the subtly and sophistication of his Bach readings. But then, fifteen years is a long time in Bach interpretation, so comparing recordings of today with those of the early 90s does seem anachronistic. Even though Koopman continues to perform Bach like this, it is worth bearing in mind that this box set is a reissue. That's not entirely clear from the packaging, although anybody who has even a vague familiarity with the industry will have worked it out simply from the box-set format. Things have moved on, and in a sense this is a historical document. That's not to say that all change is good, and this look back to Bach of yesteryear demonstrates some of the ways in which recent performances could improve. I'm particularly taken by the sense of breadth that Koopman achieves in the choruses, especially in the Matthew. With the fast tempos and small ensembles of today, you just don't get that any more, which is a real shame. Then there are Koopman's collaborators, all of whom do him proud. Tastes may change in matters of instrumentation, ornamentation, tempo or dynamics, but world-class performance standards are never going out of fashion.